So many aspects of human neuroanatomy and neurophysiology refer to early development that even casually interested one sooner or later find out they must come to grips with the underlying embryology. Here, the task is: (1) to present only those neuroembryological concepts that are necessary for the study of neurophysiology and (2) to review the major structures and systems involved in nervous system organization and classification. It is not intended to be an exhaustive (or exhausting) treatment of the field. The basic units of nervous tissue are its cells. These include neurons, which are the excitable impulse-conducting cells, as well as several types of nonexcitable cells. The latter include the neuroglial and ependymal cells of the central nervous system (CNS) and the Schwann cells of the peripheral nervous system (PNS). Many neurophysiologists find themselves somewhat baffled by terminology and classification systems. Many of the terms and systems are based on embryological origins, and the beginner who has avoided or not been exposed to embryology will encounter some difficulty. One major effort here is to present just enough embryology to explain the origins of the various components of nervous tissue. The beginner should also come to appreciate the reasons behind many of the classification schemes for nerve fibers. receptors, and the various functional divisions of the nervous system. The developing embryo is characterized by three germ layers, which give rise to the various specialized systems of the body. 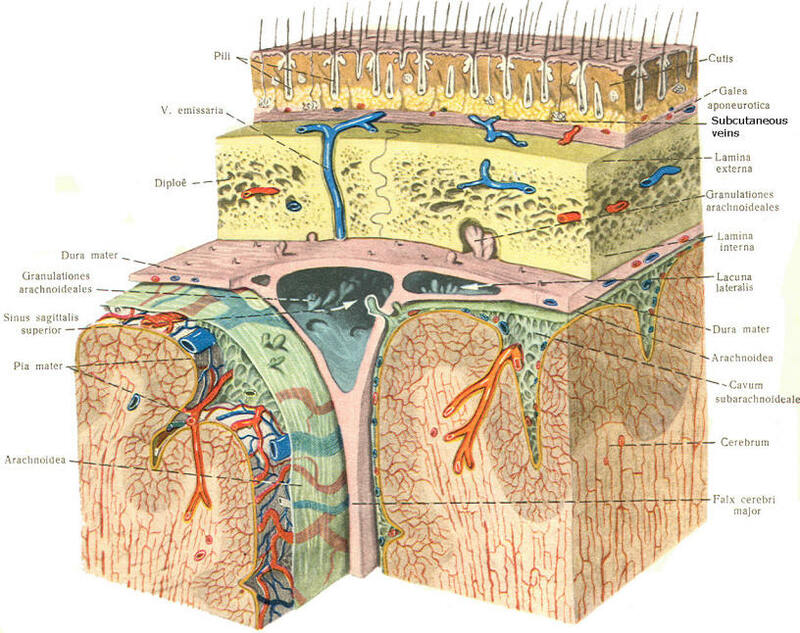 These are the ectoderm, the mesoderm, and the entoderm (Fig-1). The ectoderm is of particular interest to the neuroscientist because it gives rise to the nervous system as well as the epidermis with all of its sensory receptors. The mesoderm gives rise to connective tissue as well as the skeletal, muscular. circulatory, and urogenital systems and glands. From the entoderm arise the digestive and respiratory epithelia. 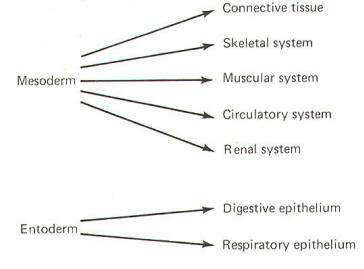 The three germ layers and the tissues which develop from them are summarized in Fig-2. About the seventeenth day following fertilization, the notochord induces the ectoderm in the middorsal region to differentiate. That is, it thickens, forms a neural groove, and becomes the neural ectoderm. During the next 4 days the neural ectoderm begins to separate from the remaining ectoderm (called the surface ectoderm) and begins to invaginate, converting the neural groove to a neural tube with two parallel-running neural crests. This process is called neurolation (Fig-3). 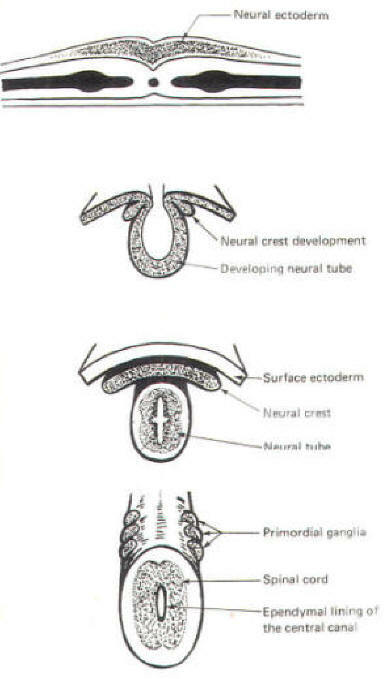 Soon after formation of the neural tube, the neural crests subdivide into primordial ganglia. 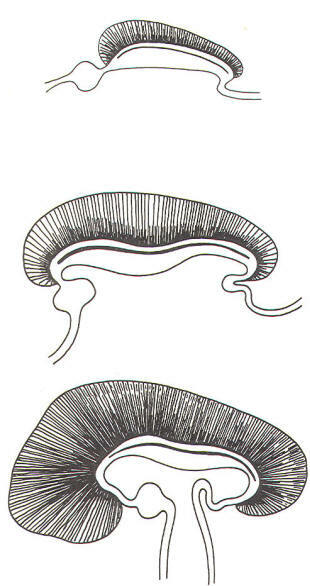 Each of these ganglia corresponds to a primitive somite or body segment. The neural crest gives rise to neuroblasts (cells which later become neurons) and nonneuroblastic cells which later become the Schwann cells of the peripheral nervous system. 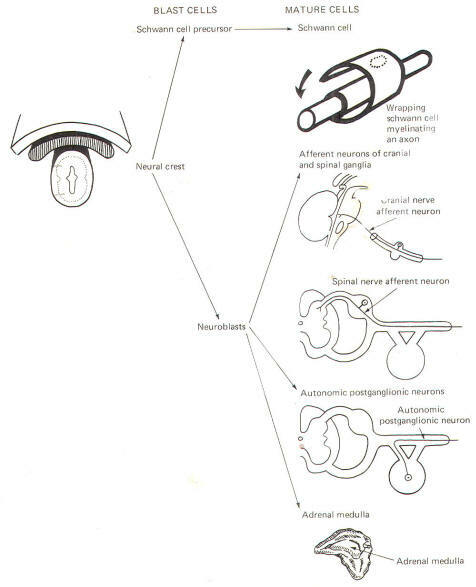 Neuroblasts eventually give rise to the autonomic postganglionic neurons, the adrenal medulla, and the afferent neurons of the cranial and spinal ganglia (Fig-4). The neural tube becomes the brain and spinal cord of the central nervous system. The neuroepithelial cell lining of the neural tube gives rise to neuroblasts from which arise all CNS neurons with the exception of those in the mesencephalic nucleus of cranial nerve V, which are probably of neural crest origin. Certainly the motor neurons of the cranial, spinal, and preganglionic autonomic nerves arise from neuroblasts of neural tube origin. The nonexcitable cells of the central nervous system also arise from the neuroepithelial cell lining of the neural tube. Some of these cells remain fixed in position and become the single layer of epithelial cells which later line the ventricles of the brain and the central canal of the spinal cord. This lining is the ependyma and it separates the cerebrospinal fluid (CSF) of the ventricles and central canal from the excitable tissue of the brain and spinal cord. Other cells (glioblasts) migrate through the neural tube and give rise to the neuroglial cells of the CNS. 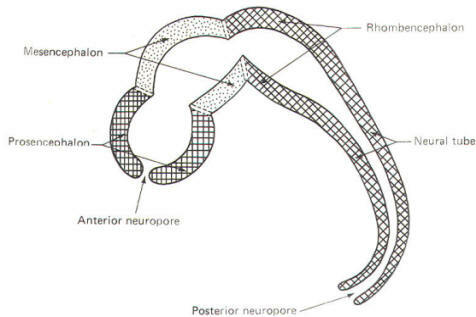 The structures which arise from neural tube origin are illustrated in Fig-5. The cephalic end of the neural tube, which is larger than the posterior end from the very beginning of its embryological development, gives rise to the brain. The brain includes the cerebral hemispheres, the brainstem, and the cerebellum. The embryo, which is essentially a disk during its early stage, begins to undergo flexion, a process of curving during which time it is transformed into a tube (Fig-6). It is eventually joined to its extraembryonic membranes only by a thin stalk, the umbilical cord. Flexion results from the rapid growth of the dorsal aspects of the embryo and is characterized by a relatively rapid growth and development of its cephalic (front) end into the brain. The notochord, a midline structure, is apparently responsible for inducing the development of the brain and spinal cord. The notochord itself is mesodermal tissue and eventually gives rise to the vertebral column and cranium, which enclose and protect the brain and spinal cord. Examination of the 28-day embryo shows that the lumen of the neural tube is large in the cephalic end and relatively narrow in the rest of the tube. The large cephalic lumen becomes the ventricular system of the brain, while the remaining narrow lumen becomes the central canal of the spinal cord. The ventricular system and the central canal are continuous with each other and are filled with CSF. The cephalic neural tube itself becomes brain tissue proper. Early on, three easily identifiable enlargements can be seen in the embryonic brain. 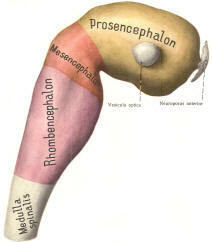 These are the prosencephalon (forebrain), the mesencephalon (midbrain), and the rhombencephalon (hindbrain). These are illustrated in Fig-7. 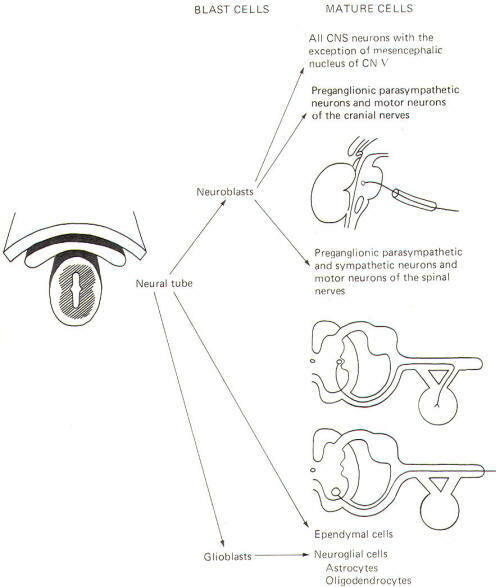 The neural tube is initially open at the anterior pole of the prosencephalon (anterior neuropore) and also at the posterior end of the neural tube (posterior neuropore). These pores later close. 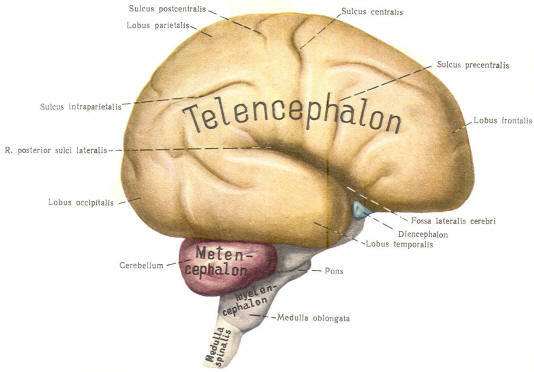 With subsequent development, the prosencephalon differentiates into the telencephalon (endbrain), which is entirely represented by the two cerebral hemispheres, and the diencephalon (betweenbrain), composed of the thalamus, hypothalamus, subthalamus, and epithalamus. 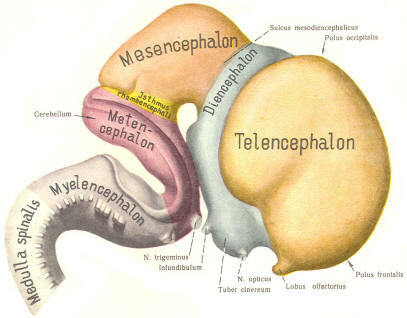 The mesencephalon also continues to develop but it undergoes no further subdivision. 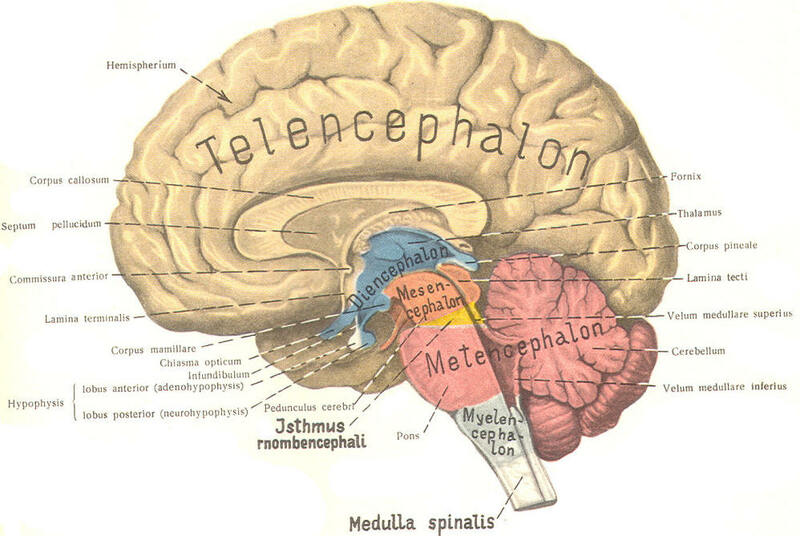 The rhombencephalon gives rise to the metencephalon (afterbrain), which includes the pons and cerebellum, as well as the myelencephalon (marrowbrain), which becomes the medulla oblongata (Fig-8). As the embryo develops, coverings called the meninges (of mesodermal origin) develop along with it and completely enclose the brain and spinal cord. The meninges separate the brain and spinal cord from the bony surface lining of the cranium and vertebral canal. Soft meninges or leptomeninges include the piamater, an extremely thin membrane which is in direct and intimate contact with the brain and spinal cord, and the arachnoid membrane, connected to the pia by strands or webs. The dura mater (hard meninges) is a tough covering which separates the soft meninges from the bony cranial vault and the vertebral canal. The leptomeninges may be derived from the neural crest, while the hard meninges develop from ordinary mesenchyme. 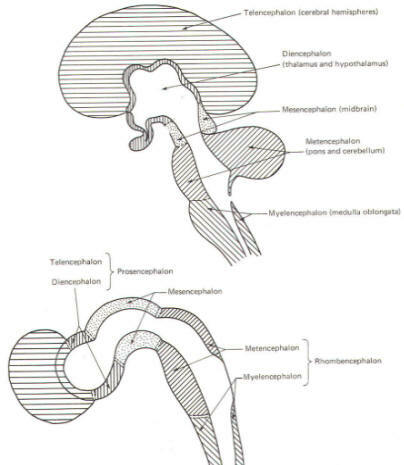 The meninges are illustrated in Fig-17 and 18. In addition to providing protection to the brain and spinal cord, the meninges serve to accompany blood vessels to and from CNS tissue as well as to channel CSF around the exterior surfaces of the brain and spinal cord. The brain's ventricular system develops right along with the brain itself. 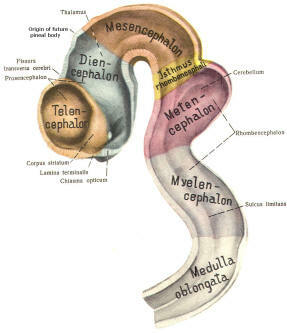 The ventricles represent the full development of the lumen of the cephalic end of the neural tube. They are filled with CSF, interconnected, and continuous with the central canal of the spinal cord. 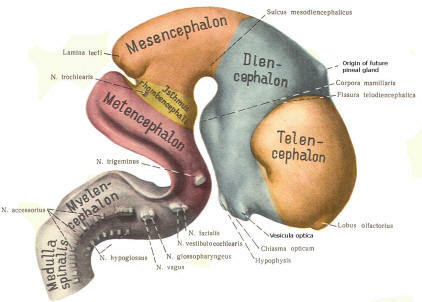 As the telencephalon develops in a lateral and caudal direction, forming the hemispheres, the lumen of the telencephalic neural tube develops along with them, forming two lateral ventricles, one within each hemisphere. 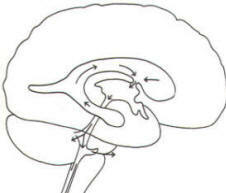 The CSF of the two lateral ventricles eventually becomes separated by a thin membrane, the septum pellucidum. 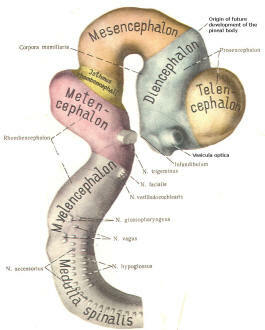 As the diencephalon develops, the neural tube lumen expands in the mid­sagittal plane into a broad, flat third ventricle. The CSF in the lateral ventricles communicates with that in the third ventricle through the foramina of Monro. The medial walls of the diencephalon are completely bathed by the CSF of the third ventricle, which flows around the interthalamic adhesion into the cerebral aqueduct (Fig-19). The cerebral aqueduct is a narrow channel through the midbrain. The CSF of the third ventricle flows through this channel into the fourth ventricle located posterior to the pons and anterior to the cerebellum. A small amount of the CSF from the fourth ventricle flows into the central canal of the spinal cord, but the greatest bulk of it flows into the subarachnoid spaces of the meninges through three openings in the fourth ventricle. 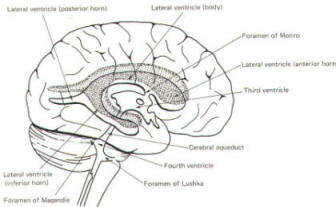 Two of these openings, the foramina of Luschka, are located in the anterior lateral extensions of the fourth ventricle around the brainstem inferior to the pons. 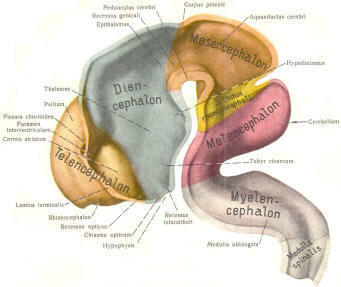 The other is the foramen of Magendie, a posterior opening in the inferior medullary velum below the cerebellum. A convoluted network of blood vessels traveling in the pia projects into the ventricular system at several points. These blood vessels are covered with ependyma since the entire ventricular system is lined with ependyma. The vascular protrusions with their coverings of specialized ependymal cells are the choroid plexuses of the ventricular system (Fig-20). 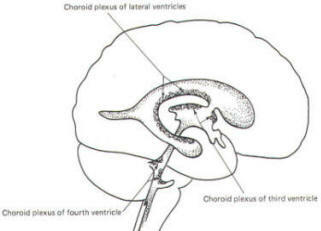 The choroid plexus is located in the medial walls of the lateral ventricles, the roof of the third ventricle, and the roof and anterior lateral extensions of the fourth ventricle. Cerebrospinal fluid is a clear and colorless liquid. It is actively secreted by the choroid plexus into the ventricular system at several points, but it is not a simple ultrafiltrate of the plasma from which it is formed. The CSF formed by the choroid plexus of the lateral ventricles flows through the foramina of Monro into the third ventricle, where it joins that produced by the choroid plexus of the third ventricle. As previously noted, it then leaves the third ventricle through the cerebral aqueduct to enter the fourth ventricle, where, most of it flows out through the foramina of Luschka and Magendie into the subarachnoid spaces of the meningeal system (Fig-21). Through this system CSF flows over and around the entire brain and spinal cord. Because CSF is constantly being formed by the choroid plexus (about 500 ml per day) and entering the ventriculomeningeal system, it is apparent that it must also be removed from the system at the same rate in order to maintain the constant value of 150 ml which is common in the adult. 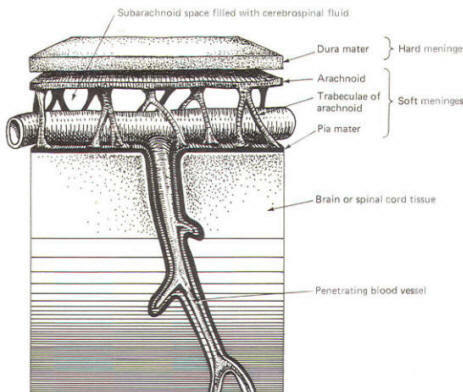 Small elevations of the arachnoid (arachnoid granulations) into the superior sagittal and transverse sinuses apparently function as one-way valves allowing CSF to be reabsorbed back into the venous blood (Fig-22). CSF tends to accumulate in certain large subarachnoid areas of the brain and spinal cord. These are called cisterns in the brain (Fig-13). 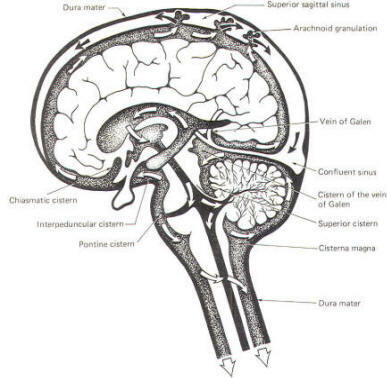 The cisterna magna, just below the cerebellum, is the largest of these. Others include the pontine cistern, anterolateral to the pontomedullary border, the interpeduncular cistern, anterior to the midbrain and inferior to the diencephalon, the chiasmatic cistern surrounding the optic chiasm, the superior cistern, between the cerebellum and the inferior colliculi of the posterior midbrain, and the cistern of the vein of Galen, posterior to the diencephalon. The subarachnoid space is relatively large below the level of the second lumbar vertebra and contains a relatively large amount of CSF. Because this is below the termination of the spinal cord, a needle can be safely passed into the subarachnoid space in this region to withdraw a CSF sample or to make an injection. Less commonly the cisterna magna is used for this purpose. The chemical composition of CSF is similar to plasma. This is not surprising since it is actively secreted by the choroid plexus. The principal difference is that plasma contains about 300 times as much protein as CSF. A brief summary of plasma and CSF concentrations is given in Table-1.